We had a blast this weekend. Heritage Fest kicked off on Friday night at Pierce Field & Stadium in East Providence. Locals came to ride the ferris wheel, chow down on favas, and wash it down with a ‘Gansett. Tavarez was the main attraction on Saturday night performing such hits as, “More Than A Woman” and “Penny For Your Thoughts.” It finished up Sunday with, a powerhouse perfomance from Pink Floyd tribute band, The Machine. They opened their set with “In The Flesh?” the opening track from The Wall, Floyd’s epic ’79 album. They continued to play such hits as “Mother” and “Another Brick In The Wall pt. 1 and 2” off the same record. Clammie even made an apperance and was adored by all. Just check out the video we captured. Indie Arts Fest on Saturday was amazing. Despite the heat everyone was cooling off with a ‘Gansett or ‘Gansett light and rocking out to some great tunes. The ‘Gansett Girls were pouring drafts and getting signatures for the petition. Keep Me Conscious, in the videos below, took the main stage while the Fountain of Youth skate park took over the rink. Burnside Park turned into The Arts Exchange where local artists were selling everything from hand-crafted jewelery, to clothing, and even vinyl records. While mingling around the bazaar you could hear bands like Saint Jude and Triangle Forest on the second stage. The Providence Roller Derby held a match right after the facial hair contest. Once the sun went down everyone filled the skating center and danced to groups like San Serac, Swiss Chemistry Club, and Chinese Stars. 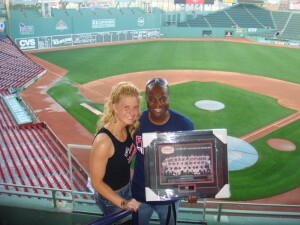 The Boston Firefighter’s Burn Foundation held their annual Firefighter Cook-Off last weekend at Fenway Park. 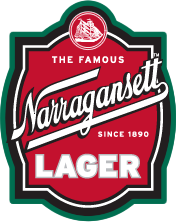 We were proud to be a part of the event and happy to keep the thirsty crowd quenched with ice cold Narragansett Lager. Sixteen different Firehouses from the Boston area competed against each other with a friendly cook-off featuring a chicken, vegetable, and starch dish. I managed to sample food from about a dozen of the 16 tables and let’s just say that everyone was a winner when paired with a ‘Gansett. Tickets were sold for various raffle prizes and sports memorabilia with 100% of the proceeds going to the Burn Foundation. We raffled off a 1959 Red Sox team photo, which was won by Rob Rogers of Brighton, MA. We look forward to a long relationship with the Boston Firefighter’s Burn Foundation and hope to see you there next year!